London: Hannah Humphrey, 1820. First Edition. Softcover. Very Good. Hand-colored by Cruikshank. Engraving on wove paper. 9-3/4 x 13-3/4 inches (w 33.8 x h 22.2 cm); 1 margin tear repaired. Trimmed. 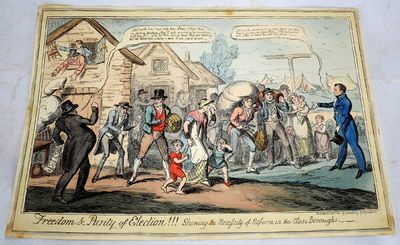 In this print Cruikshank show the elections in Cornwall (Tregony and St. Austel), a close burrow. The villagers "have displeased their feudal proprietor, and are being summarily evicted from their houses, with their household belongings, by a truculent steward, with a list of the "proscribed" held in his hand. Old and young, women and children, are alike doomed, because they or their protectors have dared to act with independence, and have not voted according to the fiat of the lord of the manor. Daniel O'Connell appears as the unsuccessful candidate; he is viewing this mischief with compassion, and is encouraging those evicted 'not to be cast down, as there are other houses besides his lordship's,' and that he ... 'will not desert them, although they have lost the election.'" - Grego, Joseph. "A History of Parliamentary Elections and Electioneering in the Old Days," p. 340-341. Refs: Cohn 1130. Catalogue of Political and Personal Satires preserved in the Department of Prints and Drawings in the British Museum, Mary Dorothy George, v. 10, no. 13710. According to the back matter, this particular print was exhibited in Exeter Hall in 1863 and was hand colored by Cruikshank.